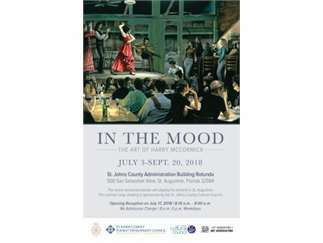 Harry McCormick, the world-renowned artist, will display his artwork all summer long at the St. Johns County Administrative Building’s rotunda. McCormick is noted for his realistic paintings with a focus on light and shadow, and has been called a painter of “interiors” and “genre”’ – such as ordinary people doing ordinary things. Learn more at www.historiccoastculture.com/event/mood-art-harry-mccormick/.